* THE PRAIRIE RIDERS NEXT SUPPER RIDE IS ON WEDNESDAY, MAY 1ST. AT THE DEN (the old laker) IN MT. LAKE. MEET AT ISLAND PARK IN WINDOM AT 6:00 PM. *THIS WILL BE THE 1ST. RIDE OF THE NEW SEASON WITH SUPPER RIDES SCHEDULED FOR WEDNESDAY NIGHTS THRU THE SUMMER. HOPE TO SEE YOU ALL THERE. * WEDNESDAY SUPPER GET TOGETHER AT PILLARS IN JACKSON HAD 15 PEOPLE THERE FOR DINNER. 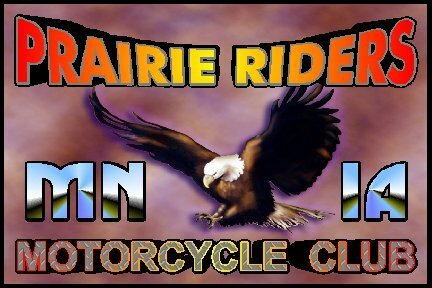 *** VISIT THE PRAIRIE RIDERS FACEBOOK PAGE @ Prairie Riders Motorcycle Club.